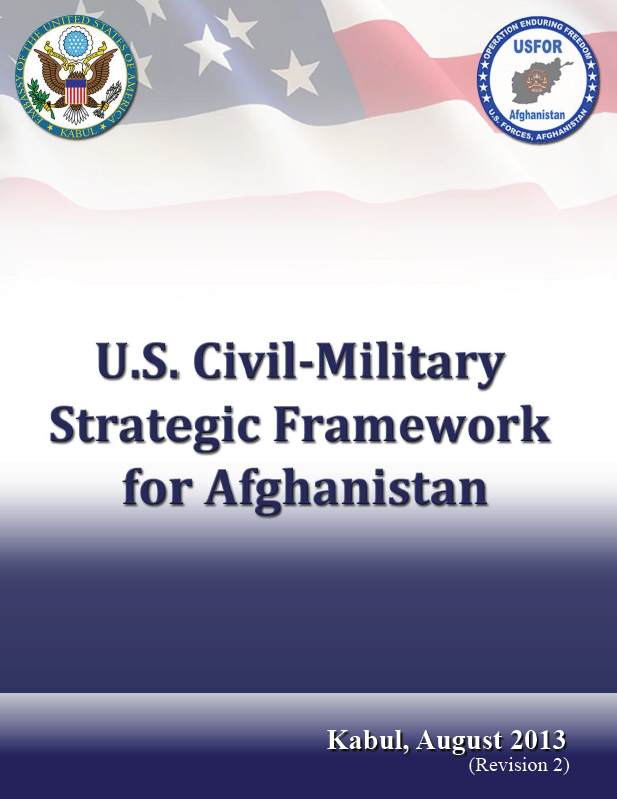 The following is the most recent version of the U.S. Civil Military Strategic Framework for Afghanistan. The original version from March 2012, signed by Ambassador Ryan Crocker and marked Sensitive But Unclassified, is also available for download. The U.S. Civil-Military Strategic Framework for Afghanistan outlines U.S. priorities through the Transformation Decade (2015-2024). It is meant to be adaptive, giving decision makers in Kabul and Washington, and policy implementers throughout Afghanistan, the flexibility needed to respond to changing conditions while advancing a set of commonly stated strategic goals and priorities. To articulate the strategic vision guiding United States Government (USG) efforts to achieve U.S. national goals in Afghanistan. To facilitate U.S. civilian and military cooperation and partnership in Afghanistan. This iteration of the Framework updates and replaces the October 2012 version. It reflects policy updates and changes related to the passage of time as well as a heightened focus on transition, greater clarity on the Transformation Decade, and guidance from the U.S. Chief of Mission (COM) and Commander, U.S. Forces-Afghanistan (COMUSFOR-A). The Framework addresses a general shift from providing to advising, preserving gains, and preparing for program implementation and monitoring in a resource and access constrained environment. Although this Framework is focused on USG efforts, its ultimate success will hinge on full cooperation with the North Atlantic Treaty Organization (NATO), the international community, and, most importantly, GIRoA. 1. Disrupt, dismantle, and eventually defeat al-Qa’ida and its affiliates and prevent their return to Afghanistan. 2. Strengthen Afghanistan so that it can never again be a safe haven for international terrorism. The United States, in partnership with the international community, is conducting a coordinated civil-military effort in support of GIRoA. Efforts in security, governance, the rule of law, and socio-economic development, together with Afghan efforts to promote an inclusive political dialogue leading to national reconciliation, should allow the USG to make substantial progress towards achieving U.S. national goals in Afghanistan by December 31, 2014. As we pursue U.S. national goals and conduct operations, we must be mindful of Afghan sovereignty and balance our efforts. U.S. efforts must align with GIRoA’s strategic vision of an Afghanistan that is reducing dependence on international assistance, improving delivery of government services, and promoting fundamental freedoms and human rights. GIRoA has outlined this vision in “Towards Self Reliance” which sets security and developmental goals for Afghanistan through the year 2030. The first and necessary step for GIRoA is to reclaim full stewardship of security, governance, rule of law, and socio-economic development. By the end of 2014, GIRoA will complete the shift from international-led to Afghan-led security while asserting full control in non-security sectors. The period of transition in the run up to 2015 is designed to allow GIRoA to gradually take the lead in critical areas and take advantage of the opportunity to fully guide these efforts with the international community in support. Our efforts should build the confidence of Afghans in their government and their security forces. Although the challenges of security, governance, rule of law, and socio-economic development will continue through the Transformation Decade, the U.S. is committed to supporting GIRoA.